From left: Idris Pada, member, Pharmaceutical Society of Nigeria (PSN), National Executive Council (NEC); Olumide Akintayo immediate past president (IPP); Senator (Pharm) Matthew Uroghide, Chairman Senate Public Accounts committee and Ahmed Yakasai, President, PSN at Senate Public Hearing on the need to check the rising menace of drug abuse in Nigeria at the conference hall,Senate Building National Assembly (NASS), Abuja, recently. 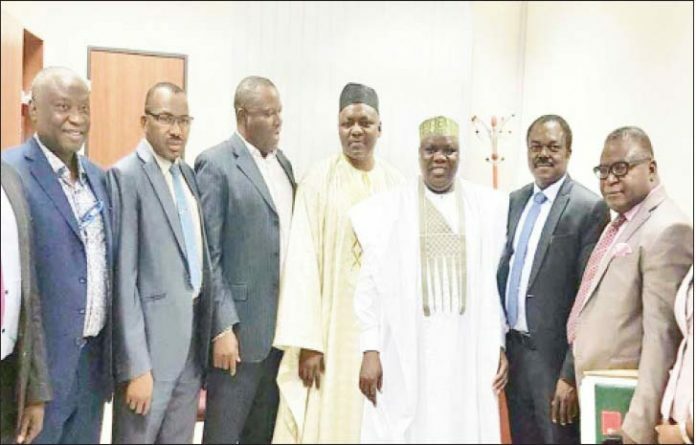 The Pharmaceutical Society of Nigeria (PSN) has advocated an amendment of the Nigeria Drug Law Enforcement Agency (NDLEA) Act to accommodate a new Directorate of Consumer Protection to be headed by a Registered Pharmacist. The PSN said the recurring menace of drug misuse and abuse is now taking unprecedented toll on the health consuming public in Nigeria. Consequently, it said the proposed Directorate of Consumer Protection should be empowered to coordinate health advocacy and monitoring/control of narcotics and other medicines with abuse and misuse potentials in Nigeria. The PSN also said it was important that the amended NDLEA Act provides for the establishment of National Rehabilitation Centres for victims of drug abuse in the six geo-political zones of the country while the rehabilitation centres should be under the supervision of the Directorate of Health Advocacy and Monitoring/Control. “We strongly urge the National Assembly to ensure that the Executive arm constitutes the governing council and boards of the plethora of agencies involved in drug distribution. This is particularly germane to an effective execution of the statutory mandate of the three principal agencies of the Federal Government involved in drug distribution endeavours in Nigeria. For the records, these are PCN, NAFDAC, NDLEA,” it said. On drug abuse and misuse, the PSN noted that prescription drugs were intended to help us, but can end up hurting us when misused or abused. “What truly is the difference between drug abuse vs. misuse as witnessed in our clime? When a person misuses or abuses a prescription drug, there is no medical oversight of the risks. For example, a person who misuses or abuses opioids such as Codeine based drugs can die from respiratory failure. Prescription sedatives like benzodiazepines such as Diazepam cause withdrawal seizures. The risks from these drugs are worse when they are combined with other drugs or alcohol. “Additionally, when a person misuses a prescription drug, even on a single occasion, that individual might enjoy the experience so much that they begin to seek out the drug more often. Thus, drug abuse and drug dependence are serious risks of misusing prescription drugs,” it explained. The PSN also explained drug misuse. “To misuse a drug is to use a drug for purposes it is not intended for. Using Codeine based Cough Suppressant for a headache, diazepam for nausea, or any other example of people believing a drug can make them ‘feel better.’ Misuse involves not following medical instructions, but the person may not necessarily be looking to ‘get high’ from their use. If a person isn’t able to fall asleep after taking a single sleeping pill, he or she may take another pill an hour later, thinking, that might induce sleep. It gave features of drug misuse as taking a dose at the wrong time, forgetting to take a dose, stopping a medication too soon, accepting prescription medication from a friend, taking drugs for reasons other than what they were prescribed for. It said, “Drug misuse is defined as the use of a substance for a purpose not consistent with legal or medical guidelines (WHO, 2006). It has a negative impact on health or functioning and may take the form of drug dependence, or be part of a wider spectrum of problematic or harmful behaviour. Drug misuse is a condition that may cause an individual to experience social, psychological, physical or legal problems related to intoxication and/or regular excessive consumption, and/or dependence. The PSN explained that people who abuse drugs typically do not have a prescription for what they are taking. “Not only do they use it in a way other than it is prescribed, but they also use it to experience the feelings associated with the drug. Euphoria, relaxation, the general feeling of ‘getting high’ is always associated with drug abuse. It said features of Drug Abuse are using a drug to ‘get high’; using without a prescription; exceeding a recommended dose; chronic or repeated abuse; and developed tolerance. “The key difference between drug abuse and drug misuse is the individual’s intentions when taking the drug. The PSN stresses that both misuse and abuse of prescription drugs can be harmful and even life threatening to the individual. This is because taking a drug other than the way it is prescribed can lead to dangerous outcomes that the person may not anticipate,” it said. The PSN also urged the Senate specially to ensure that the proposed constitutional amendments and reforms championed by the All Progressives Congress (APC) does not remove drug matters currently listed on the Exclusive Legislative List as item 21 of part I in the second schedule of the 1999 Constitution. It said most responsible and responsive countries place drug matters under federal or central control because of the need to place premium on safety and well being of consumers of health. “A country with a history of poor regulatory control in the pharmaceutical sector which continues to encourage a fake drug syndrome and challenges of drug abuse/misuse cannot afford multiple regulatory agencies to control and regulate narcotics, registration of food and drug products as well as licensure of drug premises. “Placing drug matters on the Concurrent List would imply having a minimum of 37 licencing authorities to carry out the present responsibilities of the NDLEA, NAFDAC and PCN with dire consequences to the health and security of our nation,” it said. The PSN however appreciated the National Assembly for heeding the clarion call which led to the passage of the amended Pharmacy Council of Nigeria Bill. It said the envisaged Pharmacy Council of Nigeria Bill is well grounded in law to boost the inspectorate activities of Pharmacists Council of Nigeria (PCN) which has statutory powers to regulate and control all pharmaceutical premises in both public and private sectors. “This mandate also gives PCN latitude to modulate the activities of any stakeholder in the drug distribution channels in Nigeria. “The Pharmaceutical Society of Nigeria appeals to the National Assembly to consider dispensing meaningful budgets for the inspectorate activities of the PCN. In similar spirit, these enhanced budgets must be extended to NAFDAC and NDLEA,” it said.